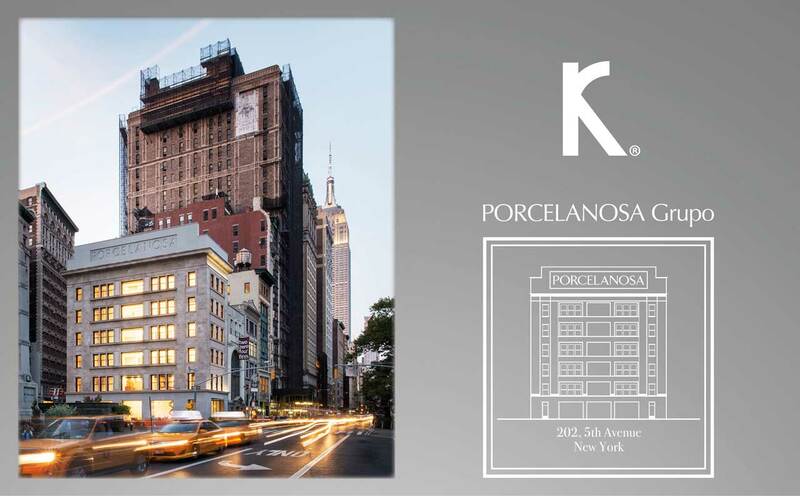 After the hangover of the spectacular inauguration party of the flagship store of the PORCELANOSA Group on Fifth Avenue in Manhattan, we want to present you with the spectacular interior, designed by the studio of Sir Norman Foster (Foster + Partners). Maintaining the facade of the historic Commodore Criterion building, 6 floors have been set up, and the basement integrated with the ground floor, with the spectacular result of an explosion of light which even further enhances the products of PORCELANOSA Group. KRION® is a significant part of the renovation and decoration of this emblematic building. In the entrance area we can find the ceiling covered with 1901 KRION® Black, and the reception table created with 1100 Snow White just like the sign at the entrance. On the first floor a backlit lithophane amazes us with the well-recognised image of New York from the Brooklyn bridge. The two-function screen and technical table is also created with the compact mineral from Porcelanosa Group, just like the ceramics storage and the auxiliary furniture. All of this, not to mention the environments created with KRION® Bath and those of our colleagues from the Group, Porcelanosa, L’Antic Colonial, Venis, Urbatek, Gamadecor, Noken, Butech and our parent company, Systempool.